Recent advances in the field of hepatology have included new and effective treatment for viral hepatitis, with an increased need for assessment of liver function and histology. At the same time, as demonstrated by the articles in this special edition, there have been a growing number of endoscopic procedures that are pertinent to liver patients. Ironically, although gastroenterology and hepatology are within the same specialty, these trends are not necessarily integrated and perhaps even disparate. Hepatologists increasingly turn to radiologists for liver imaging and interventional radiologists for liver biopsy and management of portal hypertension. However, it would be most ideal if the assessment and treatment of liver disease and portal hypertension could be performed and assimilated by the primary liver/gastrointestinal (GI) specialist. We see this integration among specialists in esophageal and pancreaticobiliary diseases. It should be no different in hepatology. We have termed this area of integration or overlap of endoscopic procedures within the practice of hepatology as “Endo-Hepatology” [Figure 1]. Currently, most hepatologists perform either upper endoscopy  or capsule endoscopy  for detecting and assessing the severity of esophageal varices. In addition, endoscopic band ligation is the preferred technique for the treatment of active bleeding and secondary prophylaxis., For gastric fundal varices, practice guidelines from our societies (American College of Gastroenterology  and the American Association for the Study of Liver Diseases ) recommend endoscopic directed intravariceal injection of cyanoacrylate glue as the treatment of choice in the setting of acute bleeding. While the current role of endoscopy in hepatology practice is limited to the assessment and treatment of varices, there is a groundswell of emerging applications of EUS to patients with liver disease. Transabdominal ultrasound is routinely utilized in assessing the liver parenchyma for the degree of fibrosis/cirrhosis and detecting occult malignancy in high-risk individuals. Low-frequency gray scale imaging (≤5 MHz) is typically used to assess the liver parenchyma, liver shape and size, spleen size, and hepatic vessel appearance. In contrast, high-frequency linear array gray scale imaging is used to assess the liver surface (>5 MHz). Doppler techniques, such as pulsed wave Doppler is used to study the portal, hepatic and splenic veins, as well as the hepatic artery with measurement of maximum or mean velocities. 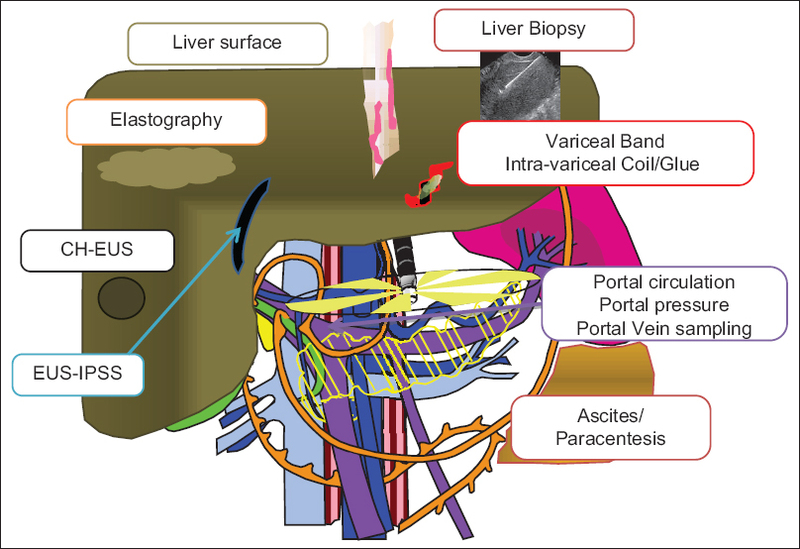 In this edition, Tsujino will discuss the assessment of liver segments using linear EUS. As you will see, EUS can be used to accurately evaluate lesion location within the liver. EUS liver segment anatomy will become increasingly important when locoregional treatments under EUS such as radiofrequency ablation, photodynamic therapy, and ethanol injection become more widely available for liver tumors. As EUS technology advances, we gain imaging enhancements. For example, elastography will likely become a standard option for EUS processors soon. Using elastography (especially transient elastography), the liver parenchymal stiffness has been measured and correlated with the degree of liver fibrosis .,,,, Another EUS image enhancement is contrast-enhanced harmonic EUS.,,, This can also potentially help improve detection of tumors in the liver.,,, Both these novel EUS enhancements are of great interest in the assessment of liver disease and will be covered in an article by Lisotti, Serrani, Caletti, and Fusaroli. A percutaneous liver biopsy is the standard procedure for obtaining hepatic tissue for histopathological examination and remains an essential tool in the diagnosis and management of parenchymal liver diseases. The use of liver biopsy is increasing with the advent of liver transplantation and the progress being made in antiviral therapeutic agents. While blind percutaneous needle biopsy has been the traditional technique, the use of US guidance has increased considerably. A recent review of the literature indicates that the use of ultrasound-guided biopsy is superior to blind needle biopsy due to higher risk for major complications, postbiopsy pain and biopsy failure in the latter. EUS-guided FNA has been reported to detect and biopsy focal lesions in the liver with high precision.,,, In this edition, Huang will show that EUS-guided liver biopsy technique has become a viable option for core tissue acquisition, especially if done concurrently (under same sedation) with surveillance endoscopy. EUS is has been shown to be very sensitive in detecting ascites. If indicated, EUS-guided FNA can be employed to perform diagnostic paracentesis.,, In addition, any suspicious nodule in the peritoneum which can be imaged through the ascites fluid can be targeted by FNA for cytological diagnosis.,, An article by Chin will focus on EUS assessment of ascites and paracentesis. In this edition, Weilert and Binmoeller provide an overview of emerging EUS-guided vascular access and therapy procedures. These include EUS-guided cyanoacrylate injection of gastric varices, EUS-guided intravascular coil placement (alone or in combination with glue injection), intrahepatic portosystemic shunt, and microcoil embolization of vascular structures to occlude small and large vessels. These are preliminary concepts with very limited data but nonetheless indicate an interesting and exciting growth area. Among the emerging EUS procedures, perhaps the “low lying fruit” may be EUS-guided liver assessment and biopsy. However, we believe many of the other possibilities will become reality as well. [Table 1] summarizes the current, emerging, and potential future roles of endoscopy in liver disease and portal hypertension. As this intersection of endoscopy and hepatology expands, it would broaden the field of Interventional EUS to include proficiency in EUS assessment of the liver, peritoneum, and portal circulation, including EUS-guided liver biopsy and therapeutic vascular intervention. Consolidating surveillance endoscopy (assessing for varices) with a complete EUS evaluation into a single comprehensive procedure would, in our opinion, optimize patient care. Moodley J, Lopez R, Carey W. Compliance with practice guidelines and risk of a first esophageal variceal hemorrhage in patients with cirrhosis. Clin Gastroenterol Hepatol 2010;8:703-8. Guturu P, Sagi SV, Ahn D, et al. Capsule endoscopy with PILLCAM ESO for detecting esophageal varices: A meta-analysis. Minerva Gastroenterol Dietol 2011;57:1-11. Khan S, Tudur Smith C, Williamson P, et al. Portosystemic shunts versus endoscopic therapy for variceal rebleeding in patients with cirrhosis. Cochrane Database Syst Rev 2006;(4):CD000553. Ravipati M, Katragadda S, Swaminathan PD, et al. Pharmacotherapy plus endoscopic intervention is more effective than pharmacotherapy or endoscopy alone in the secondary prevention of esophageal variceal bleeding: A meta-analysis of randomized, controlled trials. Gastrointest Endosc 2009;70:658-64.e5. Garcia-Tsao G, Sanyal AJ, Grace ND, et al. Prevention and management of gastroesophageal varices and variceal hemorrhage in cirrhosis. Am J Gastroenterol 2007;102:2086-102. Cardoso AC, Carvalho-Filho RJ, Stern C, et al. Direct comparison of diagnostic performance of transient elastography in patients with chronic hepatitis B and chronic hepatitis C. Liver Int 2012;32:612-21. Fransen van de Putte D, Blom R, van Soest H, et al. Impact of fibroscan on management of chronic viral hepatitis in clinical practice. Ann Hepatol 2011;10:469-76. Klibansky DA, Mehta SH, Curry M, et al. Transient elastography for predicting clinical outcomes in patients with chronic liver disease. J Viral Hepat 2012;19:e184-93. Lindvig K, Mössner BK, Pedersen C, et al. Liver stiffness and 30-day mortality in a cohort of patients admitted to hospital. Eur J Clin Invest 2012;42:146-52. Merchante N, Rivero-Juárez A, Téllez F, et al. Liver stiffness predicts clinical outcome in human immunodeficiency virus/hepatitis C virus-coinfected patients with compensated liver cirrhosis. Hepatology 2012;56:228-38. Romagnuolo J, Hoffman B, Vela S, et al. Accuracy of contrast-enhanced harmonic EUS with a second-generation perflutren lipid microsphere contrast agent (with video). Gastrointest Endosc 2011;73:52-63. Kitano M, Sakamoto H, Komaki T, et al. New techniques and future perspective of EUS for the differential diagnosis of pancreatic malignancies: Contrast harmonic imaging. Dig Endosc 2011;23 Suppl 1:46-50. Xia Y, Kitano M, Kudo M, et al. Characterization of intra-abdominal lesions of undetermined origin by contrast-enhanced harmonic EUS (with videos). Gastrointest Endosc 2010;72:637-42. Tanaka H, Iijima H, Nouso K, et al. Cost-effectiveness analysis on the surveillance for hepatocellular carcinoma in liver cirrhosis patients using contrast-enhanced ultrasonography. Hepatol Res 2012;42:376-84. Nakano S, Tsushima Y, Higuchi T, et al. Contrast- and non-contrast-enhanced ultrasonography (US) findings of hepatic metastasis from malignant pheochromocytoma/paraganglioma. Jpn J Radiol 2012;30:310-6. Strobel D, Bernatik T, Blank W, et al. Diagnostic accuracy of CEUS in the differential diagnosis of small (≤20 mm) and subcentimetric (≤10 mm) focal liver lesions in comparison with histology. Results of the DEGUM multicenter trial. Ultraschall Med 2011;32:593-7. Kudo M. Diagnostic imaging of hepatocellular carcinoma: Recent progress. Oncology 2011;81 Suppl 1:73-85. Al Knawy B, Shiffman M. Percutaneous liver biopsy in clinical practice. Liver Int 2007;27:1166-73. DeWitt J, LeBlanc J, McHenry L, et al. Endoscopic ultrasound-guided fine needle aspiration cytology of solid liver lesions: A large single-center experience. Am J Gastroenterol 2003;98:1976-81. Nguyen P, Feng JC, Chang KJ. Endoscopic ultrasound (EUS) and EUS-guided fine-needle aspiration (FNA) of liver lesions. Gastrointest Endosc 1999;50:357-61. Hollerbach S, Willert J, Topalidis T, et al. Endoscopic ultrasound-guided fine-needle aspiration biopsy of liver lesions: Histological and cytological assessment. Endoscopy 2003;35:743-9. Jagannath S, Puri K, Kantsevoy S, et al. Endoscopic ultrasound and fine needle aspiration for the diagnosis of hepatocellular carcinoma. Minerva Gastroenterol Dietol 2008;54:125-30. Rial NS, Gilchrist KB, Henderson JT, et al. Endoscopic ultrasound with biopsy of omental mass for cholangiocarcinoma diagnosis in cirrhosis. World J Gastrointest Endosc 2011;3:124-8. Rana SS, Bhasin DK, Srinivasan R, et al. Endoscopic ultrasound-guided fine needle aspiration of peritoneal nodules in patients with ascites of unknown cause. Endoscopy 2011;43:1010-3. Rana SS, Bhasin DK, Srinivisan R, et al. Endoscopic ultrasound fine-needle aspiration of peritoneal deposits for diagnosis of tubercular peritonitis in a cirrhotic patient with ascites. Endoscopy 2010;42 Suppl 2:E306-7.